← Worcester, Massachusetts. April 12th, 2011. Saskatoon, Canada. April 13th, 2011. City crews have begun work to repairs to a section of 22nd Street in downtown Saskatoon. The westbound lanes of 22nd Street between 3rd and 4th Avenues remain closed to traffic today because of a large sinkhole in the middle of the street. 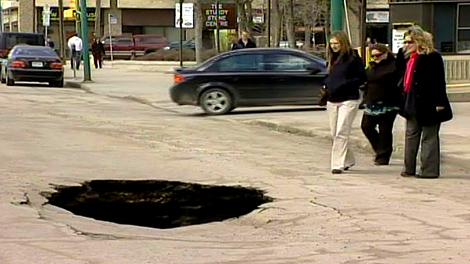 The city says the hole is almost three metres deep and large enough to swallow a car. Crews blame a sewer line. They say pipes broke after freezing over the winter. It’ll likely take two days to repair the roadway. This entry was posted in Pictures and tagged Canada, Saskatoon, sinkhole, water main. Bookmark the permalink.